Dhaka, Aug 10 (Just News): Bangladesh Nationalist Party on Friday demanded of bringing necessary amendment to the proposed road transport law as it would not ‘ensure’ safety in roads demanded by the agitated students in recent movement. 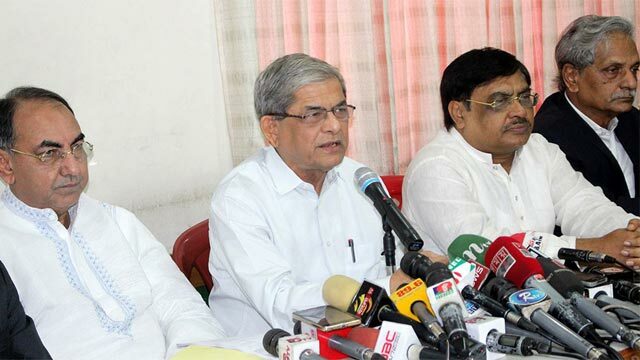 BNP secretary general Mirza Fakhrul Islam Alamgir flanked by the party’s senior leaders at the party’s central office made the demand. He asked for amending the law through holding effective discussion with the protestor students for safe roads and those are working for long time for safe road. Fakhrul claimed that everybody except Transport Owners’ Association rejected the draft Road Transport Bill 2018 approved by the cabinet on Monday in the wake of the students movement. He said safe road would not be attained as per demand of the agitated students in the proposed amended law. The secretary general said there is no clear guideline in the proposed law about avoiding killing of human in road transport sector and unwanted accident or there is no provision of tough punishment. He said there is no provision in the proposed law about effective legal steps against transport owners and check corruption in BRTA. BNP leaders including Khandaker Mosharraf Hossain, Moudud Ahmed, Goyeshwar Chandra Roy, Abdul Moyeen Khan, Nazrul Islam Khan, Abdus Salam and Ruhul Kabir Rizvi, among others, were present.